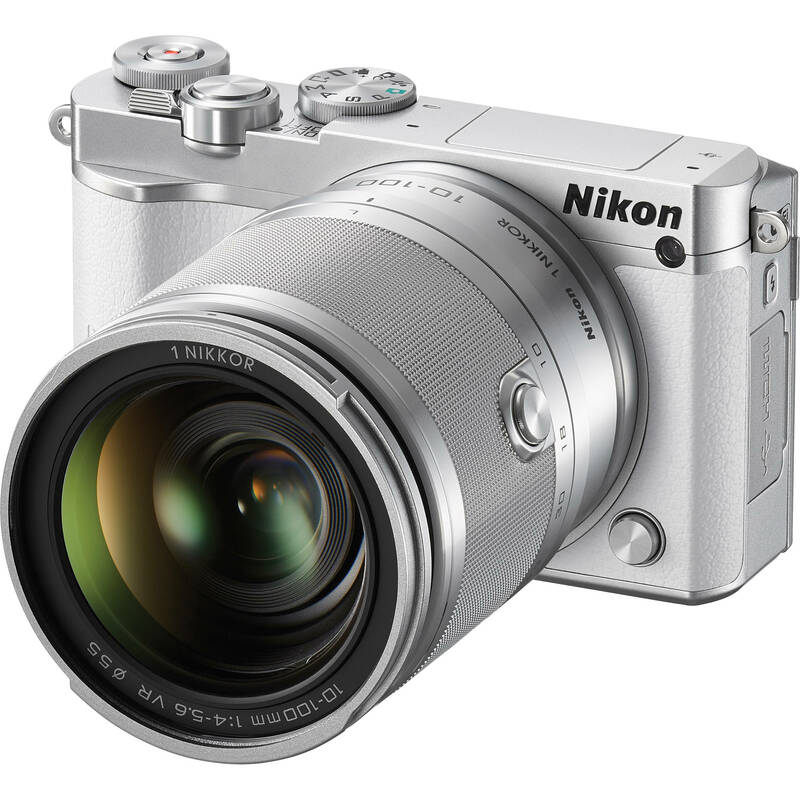 Blending speed, versatility, and image quality, the white Nikon 1 J5 is a sleek mirrorless digital camera designed for the multimedia photographer on-the-go. Featuring a 20.8MP CX-format BSI CMOS sensor and EXPEED 5A image processor, the J5 is capable of recording up to 20 fps with continuous autofocus as well as UHD 2160p/15 or full HD 1080p/60 video. A top sensitivity of ISO 12800 benefits working in difficult lighting conditions while the BSI design of sensor helps to achieve greater image clarity with reduced noise levels and the omission of an optical low-pass filter further contributes to a high degree of sharpness and resolution. Complementing the imaging assets, the 1 J5 is also characterized by a revamped, retro-inspired body design featuring a 3.0" 1,037k-dot touchscreen LCD that tilts 180° upward for prime selfie compositions. Additionally, snapbridge Wi-Fi connectivity with NFC also allows for instant wireless image sharing and remote camera control from mobile devices. Included with the camera body is the wide-angle to telephoto 1 NIKKOR 10-100mm f/4.0-5.6 VR lens, which provides a 27-270mm equivalent focal length range. Three aspherical elements are incorporated within the lens' design, as well as a Super Integrated Coating, and Vibration Reduction benefits the creation of sharp imagery by minimizing the appearance of camera shake. Characterized by a sleek and retro-inspired design, the compact profile includes a range of control and command dials, customizable function buttons, and a large 3.0" 1,037k-dot LCD monitor. The LCD features a 180° tilting design for self-portraits and is also a touchscreen for more intuitive control over camera settings, menu navigation, and playback. Included with the camera body is the versatile 1 NIKKOR 10-100mm f/4.0-5.6 VR; a wide-angle to telephoto lens providing a 27-270mm equivalent focal length range. Benefitting this lens' expansive reach, VR image stabilization helps to offset the appearance of camera shake to suit working in difficult lighting conditions. The optical design incorporates three aspherical elements to reduce chromatic aberrations throughout the zoom range and a Super Integrated Coating has also been applied to minimize lens flare and ghosting for contrast-rich, color-neutral imagery. Box Dimensions (LxWxH) 7.0 x 6.2 x 4.6"
1 J5 Mirrorless Digital Camera with 10-100mm Lens (White) is rated 4.3 out of 5 by 9. Rated 5 out of 5 by marc from Nikon Packed a Lot Into This Beast am new to photography and wanted something lightweight to carry. this camera delivers on my expectations for such a compact size. the sports mode is impressively fast and i found that if i use that for low light i get some pretty decent results. as others have noted, this camera might not be the best in low light situations. that seems to be true for auto mode, but i'm sure an experienced photographer will have little trouble deciding what manual settings will give great results. the battery is pretty decent for a day out, but it's good to have a spare. i'm using it with the SanDisk XTREMEPRO MICROSD 64GB memory, B+W XS-Pro Clear MRC-Nano 007 lens filter, and the B+W XS-Pro Kaesemann High Transmission Circular Polarizer MRC-Nano filter for the lenses. the lack of a viewfinder only bothers me with the ciruclar polarizing lens because it can be difficult to see the subtle differences on the screen in bright light. i love the camera and will keep it for a long, long time! Rated 5 out of 5 by Mike from Everything I Hoped it would be. Great size. I also bought the adapter so I can use all my lenses. A little strange having 70-200 Nikon lens on this small camera body. I have the Nikon d810 with a variety of Nikon Lenses. Rated 4 out of 5 by Dan from Good camera but software glitch Good travel camera with 10-100 lens. Slow when compared to Sony A6000 and the camera hanged at least 5 times in 2 days. 10-100mm lens is too big for this flash so you get a shadow on the subjects. Nikon has to fix a certain things at the earliest. Image quality was not great too. I recommend Sony Alpha 6000 than this camera. Rated 5 out of 5 by DixieGal from Great Lightweight Travel Camera I purchased this to upgrade from the nikon D3200. I primarily use my cameras for travel photography and it is fantastic! It is so lightweight and takes fantastic pictures. Very happy that I got it before I went to Disenyland! Rated 4 out of 5 by Glooves from Surprisingly small and versatile with a classic look I bought the silver j5 for both the 10-100 lens and retro look. This is in addition to the N1 V3 that I already own. The J5 has a newer processor and is about half the price of the V3. I was looking for more lens coverage and flexibility of having two bodies on the same Interchangeable lens system. After two weeks, I'm happy with the versatility of the camera and images I've pulled from the camera. It's a sophisticated camera and provides a good balance of simplicity and features. Still getting used to not having an EVF, and finding it hard to see the screen in bright sunlight--but I knew that going in. The 10-100mm is an awesome lens--very sharp and machined feel. Coupled with the 6.7-13mm wideangle zoom, I get all the focal lengths I could hope for. The whole outfit easily fits in a small DSLR camera bag and I can carry other gear in my backpack. It's fun working with smaller gear, the camara size is crowd friendly, doesn't scream Pro-shooter, and not so intimidating to subjects. I was looking for pocketability and found it--the camera fits in a cargo-pants pocket with the 10mm 2.8 or kit 10-30 lens. Some reservation: I see that when using the PSAM dial, shutter setting is always on top, and aperture on the back--this consistency is good. However, I was used to having aperture selection on the front. I feel clumsy using the touch screen or back dial to set Aperture. Silent shooting is great but takes getting used to. With a frozen image for 2 seconds, hard to know when you've shot and when to shoot again. Learn to press to focus quickly to unfreeze the image. OTOH, 20 fps capture and just holding down the shutter button results in LOTS of pictures to choose from. Wireless operation with a phone is great. I've never had an issue with the Micro-SD card size because USB uploads or wireless transfer are fine alternatives. If it had an EVF, 5 stars. Rated 5 out of 5 by WDE from Great Travel Camera Great compact camera. Has all the features of my Nikon D7000 at about 1/3 the size. My only negative is no EVF. Rated 3 out of 5 by Anonymous from major dissapointment There is a shadow made by the lens visible when using the flash, occupying a good portion of the lower screen. This camera is practically unusable indoors at night. It is a great camera for outdoor use. Great lens for outdoors or when flash is not required. Best looks in it's class. I ma familiar with FX,&amp; DX formats. What is CX format? can I use Nikon ED lenses? If the lenses you own are designed for the Nikon F-mount used on their SLR film cameras and DSLR cameras, then you would need an adapter to connect the larger F-mount to the smaller Nikon 1 lens mount. The Nikon FT1 Mount Adapter, B&amp;H # NIFT1, or the more economical FotodioX Nikon F-Mount Pro Lens Adapter with Aperture Control for Nikon 1 Cameras, B&amp;H # FOPN1ANG, would be recommended for your needs. When you pair your J5 with your Android smart phone your phone becomes a remote plus MORE !! Iam interested in a camera that can shoot good still picture and take video how long can the nikon j5 shoot in video mode? Sadly there is no short answer. The size AD card, the battery charge, and the video resolution and frame rate, of which several are available, are all factors. There are estimates in the manual. Does it have a view finder? Not a bad camera but I am wondering why it was discontinued so quickly? I have this camera and the new 10 to 100mm lens. The lens will not work on my older Nikon1 J1 and my Nikon1 J1-- why? You may need to update the firmware of your J1 to work with the newer lens. Check online for the update. Hello B&amp;H..I would like to know if i can use our lens (Nikkor) in this body Nikon 1 J5? Could you clarify if I may use the nikkor and / or similar lenses in this body? I have a D7100 and 3 lenses.